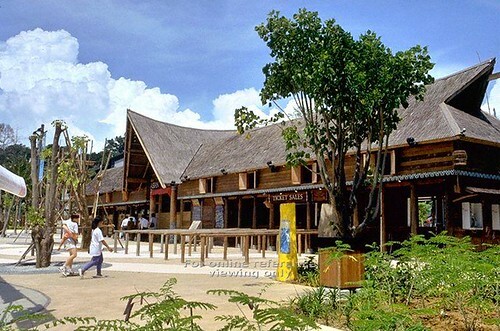 Asian Village was a theme park located in Sentosa consisting of three independent villages of distinct architecture set around a common lakefront, representing the many aspects of its namesake into one large setting. (The North Asian Village shows life in China, Korea and Japan the South Asian Village covers India, Pakistan and Sri Lanka while the South-East Asian Village is a display of scenes in Asean nations and Indochina.) Visitors could get a taste of village life by observing arts and crafts in the making, watching street performances or relish the flavours of Asian Cuisine from the plethora of street stalls and restaurants which lined the walkways. 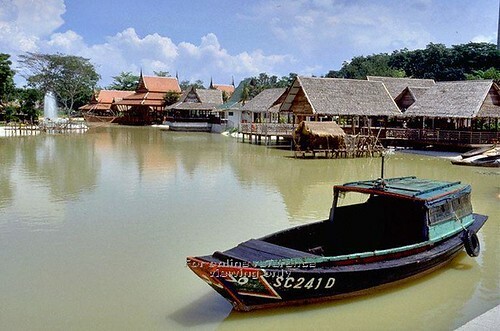 Often heralded as one of the highlights of visiting the island, the Asian Village was one of the first attractions that greeted visitors as they stepped off the ferry along with Fantasy Island, the mega water theme park which was closed off in 2001 after numerous accidents. 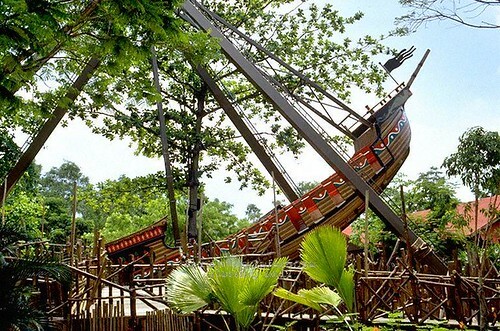 Thrilling joyrides were also available at Adventure Asia, a fairground within the Asian Village set in a tropical jungle setting. Its multitude of rides had given much pleasure and excitement to many a teenager. Intended as a mega-attraction which could cater to all ages, this cul-de-sac sadly never managed to live up to its expectations, drawing meagre crowds even on weekends. It is hard to imagine that the Asian Village first opened its doors to the public in 1993. The park remained in operation for seven years before it folded in 2000. 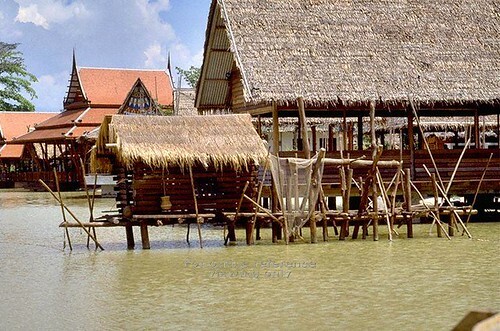 A subsequent effort to revamp and reintroduce the Central Lagoon as a fishing village for anglers was short-lived as well, failing to make any headway. With the abandoned theme park mothballed, the Sentosa management later unveiled plans to build the first of Singapore's 2 Integrated Resorts on the same land parcel. The area was cleared in late 2006 in preparation for the mega-money churning venue. First visit was back in 2005, followed by a second in 2006 (we have combined photos from both visits) . With its likely dissolution looming in the air, we took it upon ourselves to have one last look around the place, and capture as much as possible, so that we could have something to show for our future generations; that was the good old theme park where some of us would have spent much of our school holidays in our youth. Stepping through the interstice between the two metal gates - probably put up in place to screen the dilapidated state of the place from prying eyes - we were greeted by an empty house built in the Minangkabau style and standing beyond that, was the rear facade of the amphitheater, beckoning us to go forth to study its depths. Surely this place, which was used extensively to house daily themed performances, had a myriad of stories to tell. A wooden back-door led us to a narrow aisle which branched off into the changing rooms. As we entered one of these rooms, we were faced with a ghastly sight. A cluster of half broken wooden benches had been dumped in a pile. The presence of termites was substantiated by fine wood grains lying beneath the pile, the bunch of decaying wood providing fodder for these little critters. Behind these chairs were the shower cubicles, some were wide open while others had half or full drawn curtains impeding our eyes from peeking through. Surprisingly, most of these cubicles still had their shampoo and shower gel receptacles intact. A current resident of the Amphitheater, oblivious to the visitors snapping away. As we continued past the changing room, a thoroughfare led us to the next room, a mirrored dressing room where performers had their makeup and hair done. The sophisticated mirrors , which were tastefully bordered by light bulbs, must have helped quite a bit in the makeup process, making sure the artistes had put on their makeup evenly. Stepping out from the makeup room, we moved on to the large space directly behind the performing stage. There was a smorgasbord of items speckled all over the ground, abdicated by their former owners and left to canker. Among these items were a brace of legless wooden horse cutouts, used in mock kuda kepang (more info here) performances. Some props that were used in games on stage? En route to the backstage area, pieces of scaffolding, wooden stools and a dust-covered armchair and a row of tarnished shower heads flanked us on either side as we passed through the decrepit passage to the main front stage area. Stepping back out into the warmth of the sun after our little episode in the backstage area, we ventured out into the stage and the vicinity of the surrounding amphitheater. What a view it might have been for the performers, reaching out to the audience in their seats. However, today it was just an empty gallery devoid of seats, the hall filled only with the echoes of our team's colloquy. At the rear of the theater, the AV control room stands stolidly, watching over the auditorium. Moving on, we stepped back into the locality of the theme park proper. Adequately shielded from the scorching mid-day sun by the cover of palm trees, we traversed further into the theme park. This was when Sara noticed a well and made a beeline for it. Interestingly enough, there were some offerings placed nearby to the well. Belonging to the Taoist creed, six red cups were carefully lined up beside a makeshift plastic incense holder. Why were these offerings here? Were they used to appease the spirits that might roam the village grounds when night falls? A red cup was overturned. The work of pranksters, or a thirsty / scruffy bird? Or just a strong gust of wind? Leaving the environs of the South-East Asian village, we stepped into a totally different area. Fascinated, we gawked at the elaborate fantasy-styled buildings around us as we transited through an intricate arched doorway, set in the center of a palisade made from stone blocks. Surveying our surroundings, the team split up in different directions to inspect the exquisite structures around us. One such building, a majestic stone edifice standing just across the stone-paved street from the palisade, drew much attention with its enchanting facade. The fortified wall comes complete with a gazebo. Roy glinting from the gazebo. Another compelling discovery was the presence of a convoluted fountain nearby, which became the subject of many of our cameras shortly after it's uncovering. The tenacious armada of mosquitoes, probably propagated from the stagnant water in the fountain, did not stop us from advancing further to perfect that shot - for we may never have another chance to cover these grounds ever again. Some of us lingered around the alfresco area, while others entered the handful of interesting buildings scattered around the area. Most of these buildings were empty - a pale shadow of their glorious past - save for a distinctive room which was filled with a myriad of items strewn all over the floor, probably used by workers who made the place a makeshift lodging area. A forgotten altar for the Earth Deity sits forlornly in its recess, accompanied by a lone bottle of cooking oil, probably used in the past to fuel its oil lamp, which was now dry and filled with ash instead. 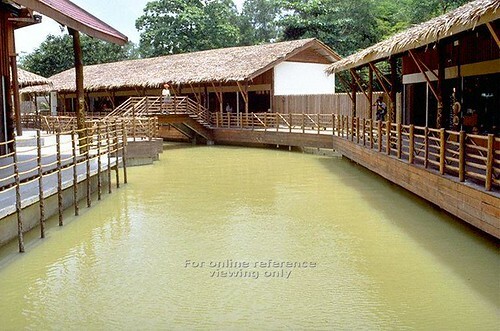 Beyond the cluster of houses, was a replica village which had a stream running through the middle, leading to the central lagoon. This village consisted of two rows of identical houses, which were all barren. The muddy and algae infested water was stagnant, and we crossed the bridge carefully. As we moved along the wooden-floored corridor, we could see a row of colourful bulbs lining the ends of the roof. Some bulbs were broken, while most others were still intact and likely to be working if connected to a power source. After - This village has seen better days. Continuing our journey, we pressed on towards the fairground where Adventure Asia once hosted thrill seekers with its eclectic selection of rides. We arrived at the end of the stream, where it joined the Central Lagoon. Walking along the bank of the lagoon, we took photos of the huts surrounding the lagoon. Most of these structures had the same architecture and were constructed with similar materials as the ones we saw earlier along the stream. 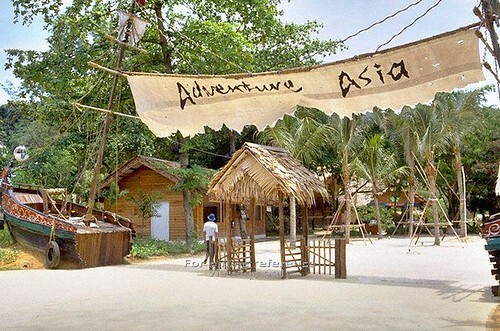 Before we could enter the former grounds of Adventure Asia, the team had to cross a wide bridge which had been badly weathered and partly caved in. We were unsure if the bridge was able to sustain the weight of the entire team. Hence, we crossed it a few at a time, treading carefully and slowly. Part of this wooden bridge had ceded to nature, with trees growing around it and deadfalls lining its pathway as well. Faye capturing the moment with his handycam. After we crossed the bridge, we had our first glimpse of Adventure Asia. A building on our left, ravaged by the forces of nature, had succumbed and resigned itself to its fate. As we traversed on, we appreciated the beauty of the former game stalls in various stages of decay. We then converged into a main wooden building with a large communal area, bordered by more stalls. Some planks, formerly a part of the flooring, had been overturned from their brackets and lay strewn across the floor. As we fanned out once again, we saw remnants of the former rides. A signboard with bright bold words stood out amongst the vegetation, a "Sultan's Carousel" no more, this was now an empty hut with a wooden sign giving us a hint of it's glorious past. Further in, we found the structure where the bumper cars used to be. I remember having a good deal of fun at this ride, spending lots of time here with my peers as opposed to other rides in the park. Now, the cars and the conductive flooring have vanished, and the weather beaten roof looked to be in severe danger of caving in. Nearby, a circular lagoon which once housed a popular water ride, so usually thronged in the past, was now desolate and a hotbed for mosquito breeding instead. Ironically, this looked like one of the enclosures in the zoo. As we strolled along, we discovered more structures left to decay. Some of these still had their safety instructions and ticket prices intact. Sadly, none of the actual rides were around any more. We half-expected to find a broken ride abandoned in one corner, but that was not to be. All the rides had probably been shipped in a large container to other countries to be sold. The frame of the small roller coaster was also left intact, although the tracks had been removed along with the coaster cars. A sharp pair of eyes were needed to spot the coaster framework in the midst of overgrown weeds. Further down from the coaster tracks, on the outskirts of the theme park's boundary which used to be fenced, now no longer; was another interesting discovery. A Thai Buddha shrine, made from reflective tiles, was found in an altar. An urn full of burnt joss sticks suggested that this deity wasn't a mere decoration but in fact a consecrated token and used to be devoutly beseeched upon by the staff that used to walk these grounds. Entering the final part of the theme park, we came across a building adorned with a stone elephant beside its front steps. This used to be a cafe , a souvenir shop and a rest area of some sort. The presence of wet clothing hanging on a clothesline indicated that someone was presently living there. Was it a janitor? Or a jaga (watchman), or even illegal immigrants maybe? To be discreet, we didn't stick around too long to find out. Making our way to the exit, we stuck to the cover of the greenery around us, making our way back to the entrance. 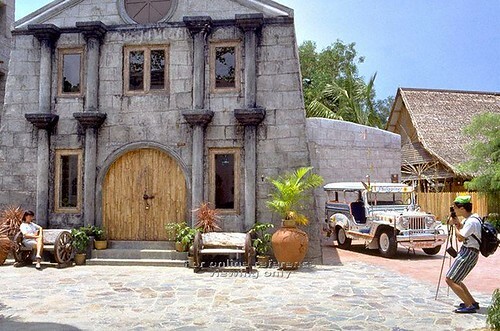 A wedding couple can be spotted here having their rustic themed bridal shots taken. Before long, the sight of the cable car above us pointed out that we were near to the exit. And at that point in time, we knew we might never see this park ever again. Reluctantly, we turned around, had a final glimpse of the park and bade our goodbyes, making our way out through the gate which we had walked in earlier. This park was to be razed to the ground in the ensuing months, making us appreciate the shots we had taken even more. I don't know about this place. But By reading your post I got impressed. Now I am interesting to know more about this.